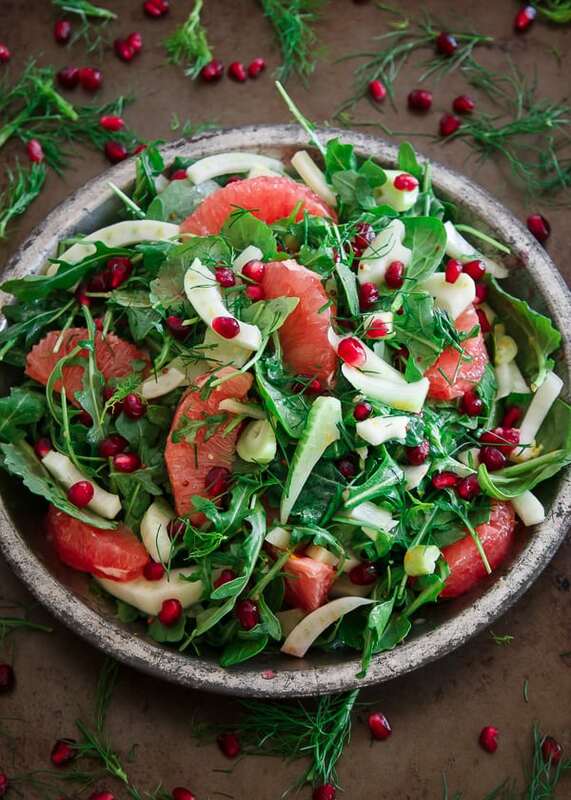 This pickled fennel citrus salad is filled with grapefruit, pomegranates, and quickly pickled fennel. Tossed with an orange dijon vinaigrette, it’s the perfect winter salad. The other day I got a text from my brother with a picture of radishes that said “from the garden, what do I do with them?” My immediate thought and response was “pickle them!” followed up with “or just roast them like these salted rosemary roasted radishes“. My sister in law preferred roasting so that’s what they did but ever since that conversation I’ve had pickling on the brain. I adore tangy stuff. You tell me something is pickled on a menu, I’m ordering it. I was the kid that used to drink the leftover dressing from the salad bowl (dressing was always olive oil + balsamic vinegar in our house) and get excited about it every single night. Tart might just be my favorite of the 5 basic taste categories and that’s saying a lot considering my sweet tooth. So to quench this pickled craving, I decided to quick pickle some fennel for this pickled fennel citrus salad. Fennel always reminds me of this time of year and holiday gatherings with some old person at the dining room table munching away at it in between dinner and dessert. Apparently, this is a super Italian thing to do, something I never realized until recently when Brandy told me her husband’s family calls it “Italian celery” and the light bulb went off “ahhh! So THAT’S why my family was always eating it!” It’s supposed to help with digestion fyi if you’re still not putting all this together. Quick pickling is such a great way to add flavor to salads or even savory things that need a balance of something tart without the huge time investment and forethought of regular pickling. Definitely check out How to Ferment Vegetables if you’re really into the pickling thing! The best part about pickling is this flavor comes at no extra caloric expense, something particularly awesome this time of year when we could all use a healthy flavorful swap or two amidst all the cookies, cakes and sweets. 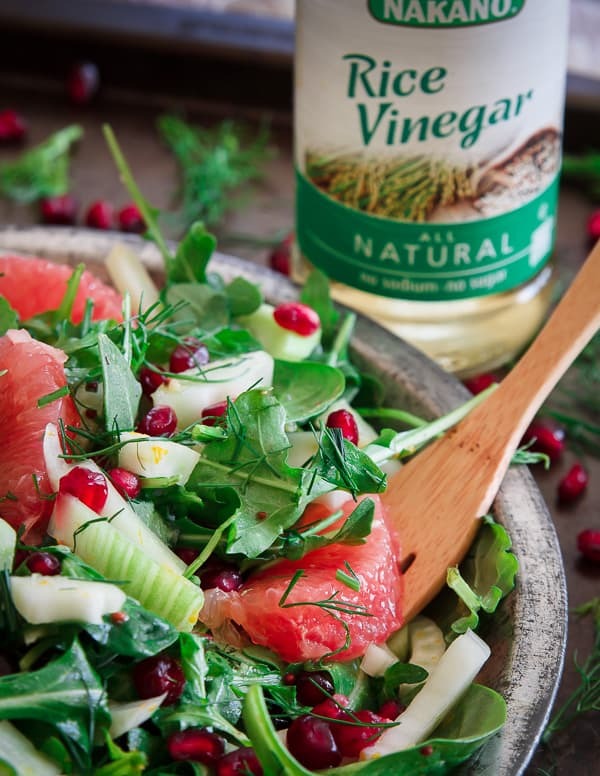 Tossing the fennel in some Nakano natural rice vinegar, orange zest and salt for just 15 minutes before putting the salad together brings a ton more interest to this winter-filled salad! Check out this winter chopped kale salad for more healthy, tangy, winter goodness! This pickled fennel citrus salad is filled with grapefruit, pomegranates, and quickly pickled fennel. Tossed with an orange dijon vinaigrette, it's the perfect winter salad. Combine the sliced fennel in a shallow bowl with the rice vinegar, orange zest and salt. Toss to combine and set aside for 15 minutes, tossing occasionally to coat all the fennel in the mixture. Make the dressing by combining all the ingredients in a small bowl and whisking together until incorporated. Toss the arugula and the dressing together in a large bowl until well coated. 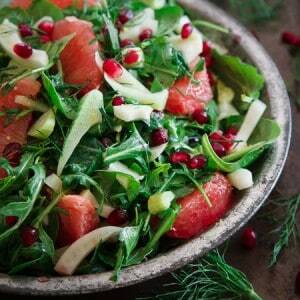 Add the grapefruit, pomegranates and fennel to the bowl and lightly toss again. Transfer the salad to a serving bowl and garnish with fennel fronds. I’m obsessed with rice vinegar and that salad — I seriously have not been able to stop staring at it since you first posted! I’ve been craving a good healthy salad lately (between all the sweets) This should hit the spot! This looks like one of the most perfect salads I have ever seen! You make the prettiest salads! Love this salad! So pretty and healthy! this is such a festive and amazing idea for a salad. My mouth is watering just from looking at your photos! 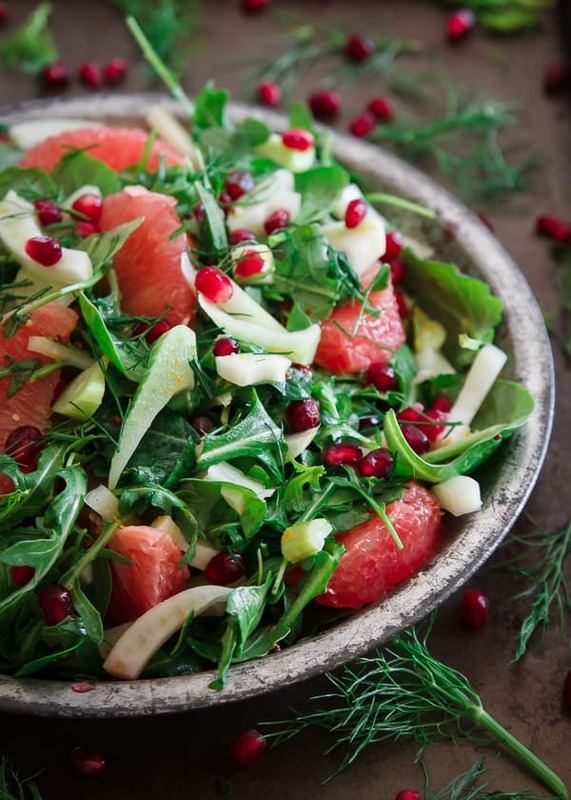 I love a fennel salad—and the addition of red grapefruit segments and pom arils make this one fabulous dish! I want this in front of me, stat. Perfect holiday dish, and all round “make me fell better” dish. I so need this to reset between all the sweets this holiday! This looks so delicious and healthy as well! This salad is stunning!! What a beautiful and delicious addition to a holiday table! This salad is so unbelievably gorgeous. I have a soft spot for anything pickled.